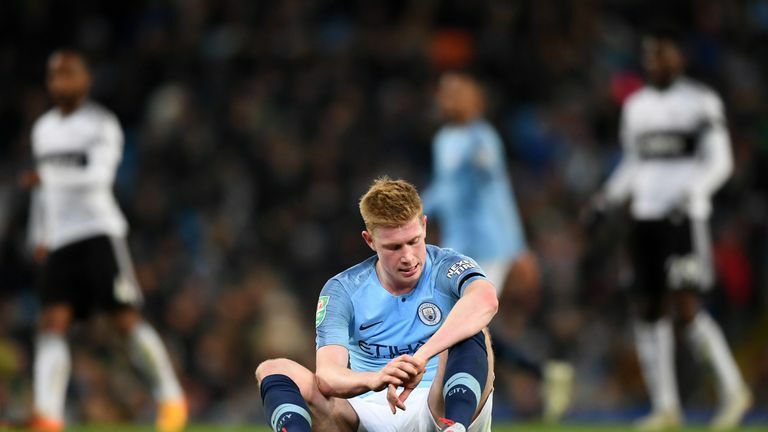 Kevin De Bruyne will be out for up to six weeks with knee ligament damage sustained against Fulham on Thursday, Manchester City have announced. De Bruyne hurt his left knee towards the end of the 2-0 win that secured City a Carabao Cup quarter-final date with either Leicester City of Southampton. The Belgium international was making just his first start since returning from an injury to his right knee, which he suffered against Arsenal in the first game of City's Premier League title defence in August. Manager Pep Guardiola confirmed that De Bruyne will not need surgery, but he is unlikely to feature again until the run-up to the busy Christmas period. "Unfortunately he is injured, but fortunately he does not need surgery," Guardiola said. "In between four and six weeks the doctor said he will come back. "Kevin was out for two and a half months, we are sad for him. When you come back [from injury] you cannot expect on day one he will be the player we know he is. "He needs time to settle and take the rhythm, pace, everything. Yesterday he came back but it is what it is." De Bruyne is yet to start a Premier League game this season, with all three appearances coming off the bench, and his only other start this term before Thursday came against Shakhtar Donetsk in the Champions League. City have another eight games in the next six weeks and among fixtures De Bruyne is set to miss are the first Manchester derby of the season on November 11, a Premier League date with Chelsea and Champions League clashes with Shakhtar and Lyon.